While writing this article, I realised today is World Habitat Day. How appropriate. The right to adequate shelter is a basic human right. Home ownership is what everyone aspires for. Unfortunately with property prices sky-rocketing, owning a house is beyond the financial means of the majority. What is sadder than being unable to own a house is to be evicted from one's own house, and see it being demolished right in front of your eyes. 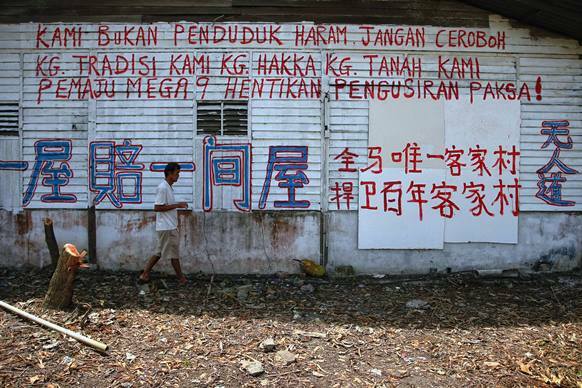 This is exactly what happened to the residents of Kampung Hakka. 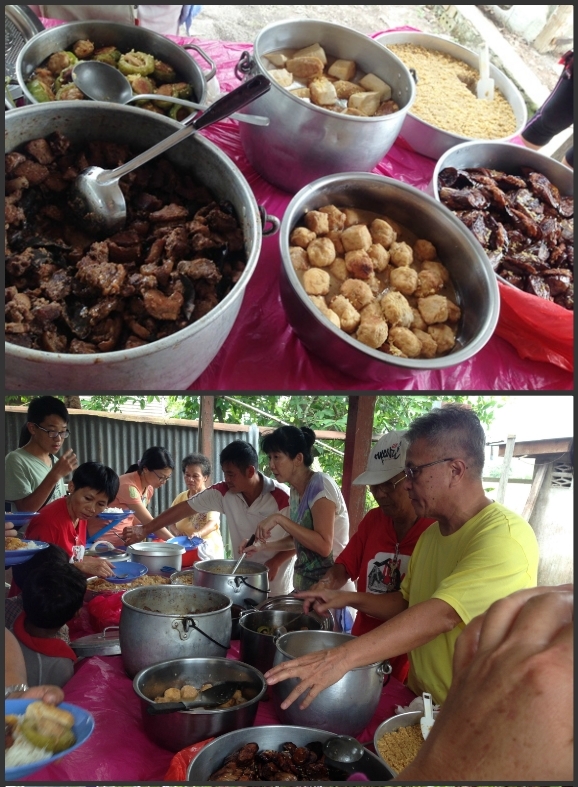 The story for me personally began a week ago when I accepted an invitation from Victor Chin to a cook-out at Kampung Hakka. So yesterday (Sunday 4 Oct), along with two friends, we made the short trip to the village in Mantin, just 45 minutes drive from Kuala Lumpur. 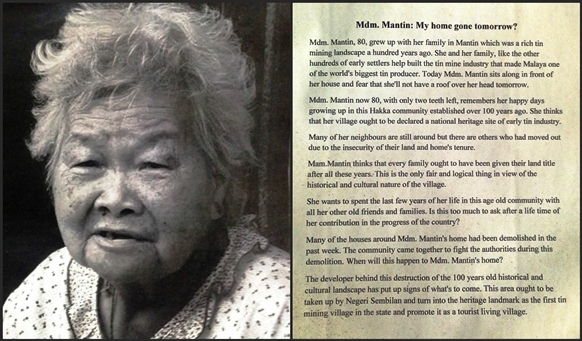 I came to know about the village after watching "Memory as Resistance" at the recent Freedom Film Fest 2015. It was an award-winning human rights film directed by Chan Seong Foong and Victor Chin. I was eager to meet Grandma Kong, 88. 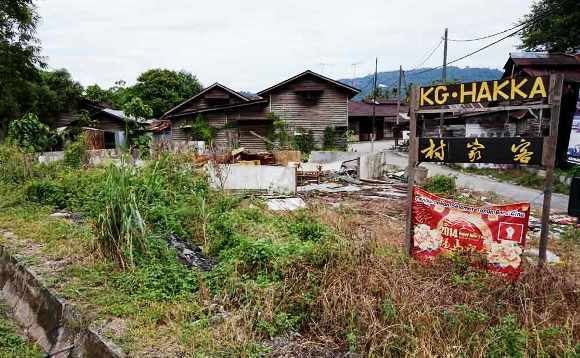 Born and raised in the 120-year old village as was her mother and her grandmother, Grandma Kong has become the face of the struggle to defend Kg Hakka against further demolition. Visiting Grandma Kong in Kg Hakka. Her house is typical of those built by the Chinese in the vllages and small towns at the turn of the 20th century. Situated across from the village community centre, Grandma Kong's humble abode welcomes all visitors. They come by the carloads every weekend: urban families curious to see the century-old village, others to capture memories of what life used to be, and the rest, like me, eager to find out what kind of assistance we could offer. 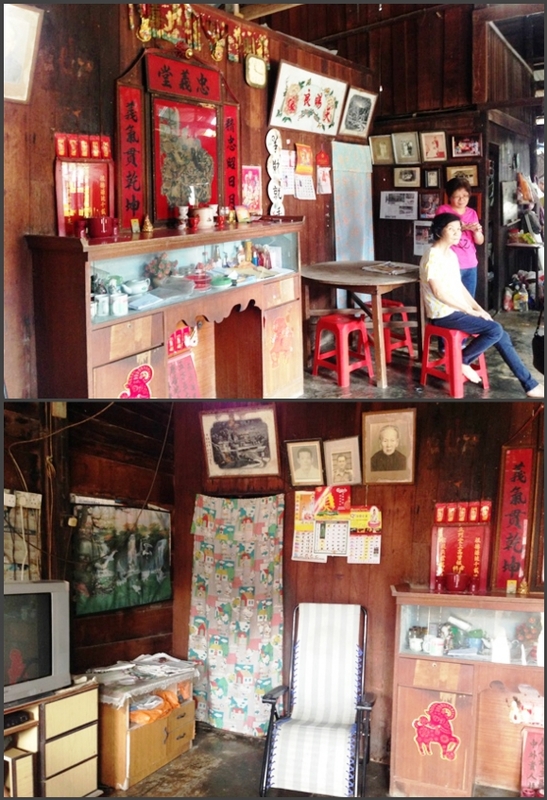 Top: Grandma Kong's house is typical of Chinese village houses built during the early tin-mining days. The altar faces the front door and occupies pride of place in the sitting room. Note the curtain in lieu of a door for the bedroom, and the row of ancestors' photos. Red scrolls with auspicious words are pasted in strategic places in the house. Grandma Kong was chatty and loved to share stories about life in the old days. I asked if she needed anything. Perhaps we could gift it to her under our 'Grant a wish for the elderly' fund. Nothing, she said. She had all she needed. Her unspoken wish was probably to live out her life in this house that has been her home for almost 90 years. It was a wish beyond our ability to grant. Do share these photos (above and below) with your grandchildren. Children brought up in urban areas and used to modernization would be shocked at how spartan and rugged life was for their ancestors. Top: The kitchen and stove. The old-fashioned way of cooking using charcoal and wood produced some of the best dishes I have tasted growing up in a small town. In the houses we visited, water comes from the well. 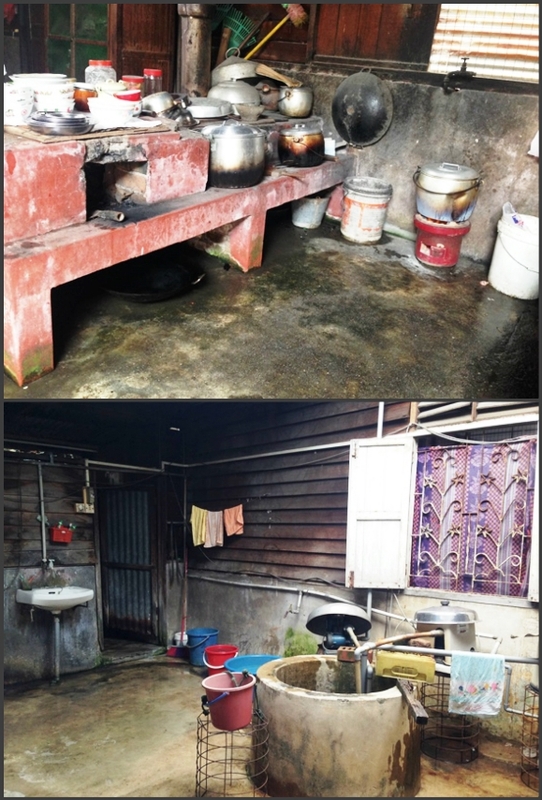 A system of makeshift pipes distributes water to the rest of the house, including the toilets. The earthen jar with the dragon motif is an ubiquitous item in Chinese homes. Note the air-well. It provides natural lighting and ventilation to the house. Rakan Mantin or Friends of Mantin organizes events and activities to raise funds to promote awareness of our historical and cultural heritage, and the need to preserve it for future generations. We joined a large group that was already there. The cook-out had just begun. 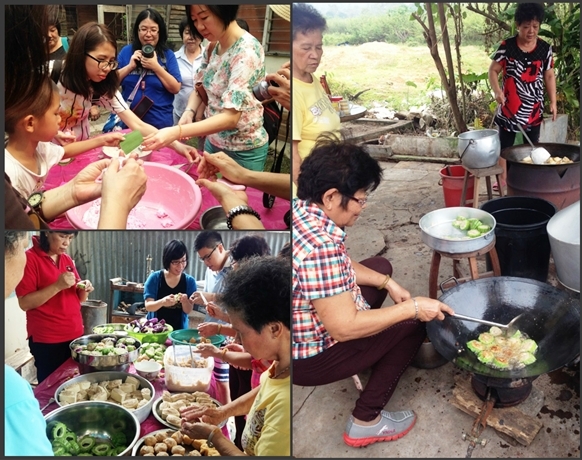 The village aunties were busy preparing Hakka dishes for lunch later. 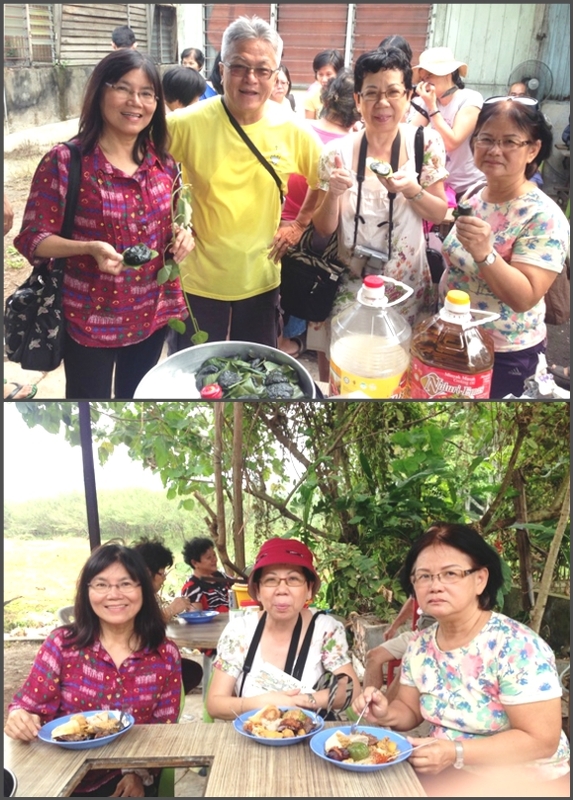 Some of the visitors tried their hand at making kueh and stuffing fish paste for yong tau fu. It was a communal activity that the womenfolk enjoyed. Here cooking was done the old-fashioned way in the open and with plenty of helping hands. Lunch is ready. Please queue - children and the elderly first. Thank you. Top: kueh made from leaves like the ones I'm holding. Eating out Kg Hakka style. Life passes slowly in Kg Hakka, especially on a Sunday. Here's a mother kneading flour to make kueh while her son looks on. Learning by observing, and then doing. No electrical gadgets, no recipe book. When friends or relatives drop by, it's a good excuse to play a game of mahjong and share the latest news or gossip over a hot cup of tea or coffee. 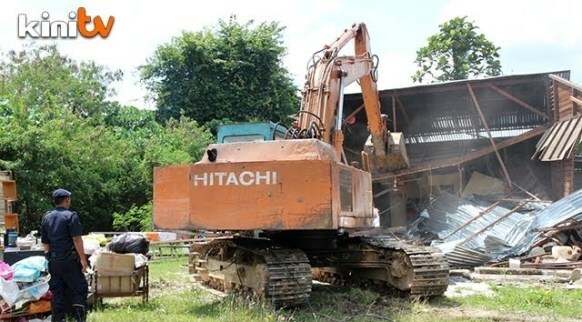 The idyllic lifestyle in Kg Hakka was rudely disrupted in November 2013 when bulldozers came and demolished 30 houses. Urban development had finally reached the doors of the villagers. We did a walking tour of Kg Hakka led by one of the village leaders. It was sad to see so many abandoned houses as well as dilapidated ones. The owners had obviously lost hope and moved out. 80 families lost their homes in Phase 1 of the demolition in November 2013. Phase 2 is on hold. 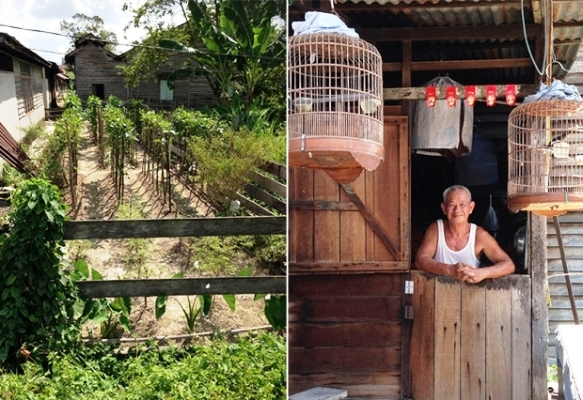 The remaining 40 families are determined to press on with their fight to save their village. 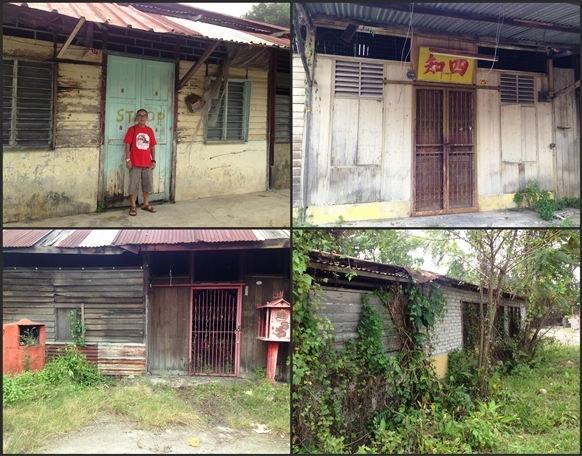 Some of the abandoned houses in Kg Hakka. 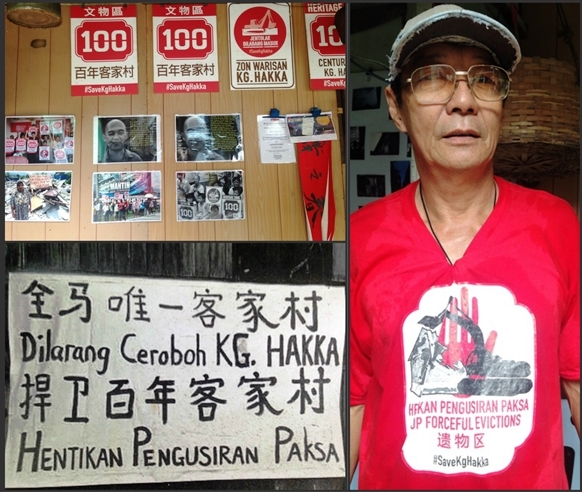 Residents like Yap Tuck Chai are determined to stop further demolition of the remaining houses. 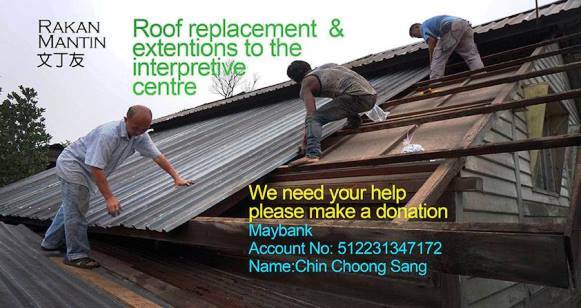 If you would like to contribute towards Rakan Mantin's efforts to get a new roof for the community centre, the details are above. SeniorsAloud will be screening "Memory as Resistance" on Friday 23 Oct morning at Wisma WIM, TTDI. This will be followed by a Q and A session with the film directors Chan Seong Foong and Victor Chin. Do mark the date on your calendar and join us for the event. More details will be announced soon on our SeniorsAloud Facebook page. Victor has really come into his own with his video campaigns & dedication to noble causes. I'm glad you connected with him & are doing your bit to raise awareness that there so many things money cannot buy & which "progress" only destroys.